The Willful Fitness Watch is one of the best sellers among cheap pedometer wristbands. It is one of the few that can do without Bluetooth and a Smartphone connection. Most other fitness bracelets can only be configured with the help of a Smartphone App. Unlike this Willful pedometer. Everything can be configured on the small touch screen (1/2 inch long): Without Bluetooth, without Smartphone and without an App. 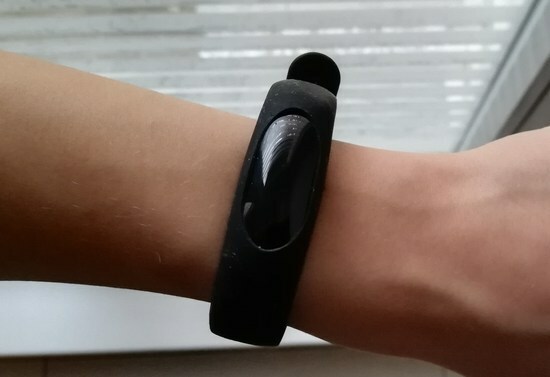 The tracker sits in a flexible bracelet made of TPU material. The bracelet is available in red, white and black. It can be adjusted between 6.5 inch and 9 inch wrist circumference. For small children between 6 and 8 years, the really small electronic unit is still a bit too large, making the bracelet too wide for the little wrists. It’s just right for our 9-year-old son. However, as you can see on the photo, the silicone wristband also absorbs a lot of dust. The set-up is pretty straight forward. First, you have to identify the round circle, the touch-button, with which you can control it. 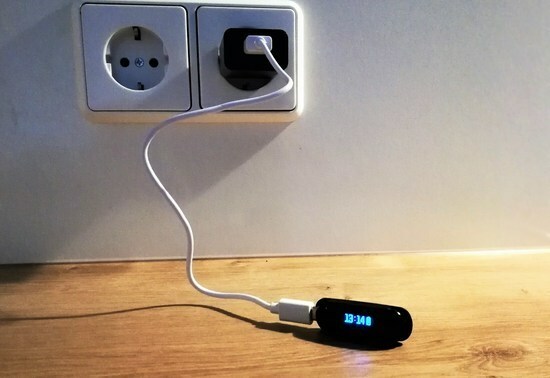 The circle is on the opposite side of the USB port through which you can charged the device. Personal characteristics: gender / age / weight / height. Our tracker was delivered with metric and 24-hour system, as we ordered it in Europe. When you order it in the US it’ll be set for Lbs and Ft.
At night, the activity data such as steps, calories, distance and speed are automatically reset to 0. The electronic unit is IP64 splash-proof. You can wear it when washing your hands or in the rain. But you should not take a shower or even swim with it. The charging time is relatively short. The first charge took about 1 hour until the pedometer was fully charged. We’ve been testing the Willful Fitness Bracelet for 7 days now and the battery is still holding. I must say, the steps are not counted with 100% accuracy, but ok, when walking normally. 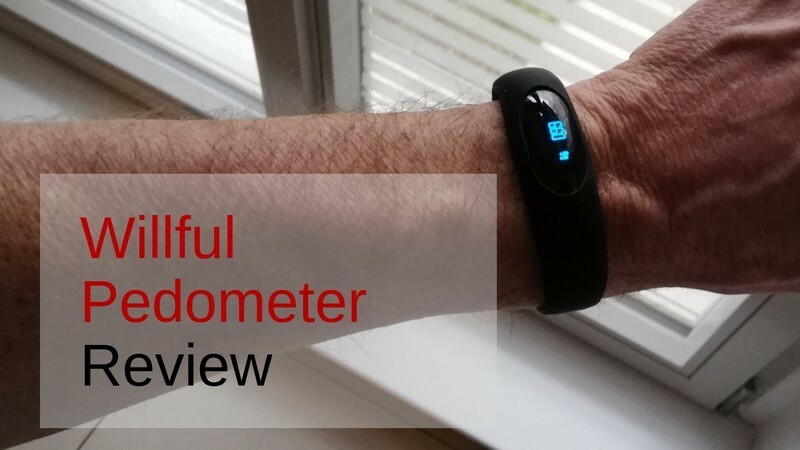 We did a couple of tests where we counted them actively and cross checked with the Letscom heart rate monitor wristband as well as a Step Counter App on my Android Smartphone. The Letscom begins to count after 35 steps. That’s not the case with the Willful. However, it doesn’t counts normal hand movements, for example, when typing on the keyboard or cooking. So you are safe on this side. We drove a bumpy road by car. The fitness bracelet did not count any steps, either. But it looks quite different when cycling. We’ve tested the Willful pedometer while cycling and corss-checked the number of steps with the Android smartphone app and the Letscom Fitness Tracker. Here we identified clear weaknesses. While the control instruments just added a few steps on a ride over bumpy cobblestones, the Willful Fitness Bracelet adds hundreds of steps, even on halfway smooth tarmac. Sure, even on a bike you are in motion, but this behavior makes the device very inaccurate. As an alternative, we recommend the Letscom heart rate monitor wristband, allthought this device needs a smartphone to set it up once, then it can be operated autonomously. The Willful Fitness Bracelet is one of the few that can be used without an App, Bluetooth connection and Smartphone. It wears comfortably on the wrist and counts the steps pretty well. Normal hand movements and driving do not distort the result. However, those who travel more often by bike should be aware that the daily result will be skewed. Well, 100 steps more or less is not that important, as long as you are consistent. But this device adds hundreds of steps after a few hundred yards on a bike. This is unacceptable. Also, the material of the bracelet is not optimal, it accumulates dust. Otherwise, a solid chic fitness bracelet at a great price. Unfortunately not suitable for cyclists!